we offer Free pick up from the airport on arrival to all our groups. We would love to host you in Corfu at our near the beach hotel and hostel! We can arrange your transfer to and from Corfu airport or port. The service is available from 06:30 to midnight. From 06:30-22:30 5€ from/to port/airport. From 22:30- midnight is 10€ from/to port/airport p.person . For 1 night stays the cost is 10€ from the airport or port. Guests who would like to use the above service are requested to provide full arrival details at least 24 hours in advance (arrival time, flight number or arrival port). Whether you choose to relax on our sea view sun deck, party in our bar, or chill on the beach watching the waves and sunset —there are plenty of activities and excursions to suit everyone. 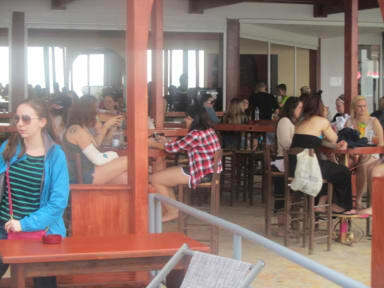 We are affiliated and combined with the Pink Palace Hotel and Hostel and operate from the Pink Palace reception. Both facilities belong to the same family so we combined them together to save running costs. Guests check-in from the Pink Palace reception and share the same facilities. No curfew or lock out, Fresh towels, linen& room cleaning and taxes included. Free access to our pool size Jacuzzi. For guests arriving between midnight and 6:30am we can arrange pick up service for 30 euros. To arrange for pick-up from the airport, notify us in advance with your arrival details: flight number, company name, time of arrival, and where your plane is coming from Please. If you are coming here from Athens there is a bus that departs Athens from the Kiffissos bus station and comes directly to Corfu, Departs daily at 7:30 am and at 7:30 pm. The bus takes 6 hours including the ferry to the island. Email the Pink Palace if you would like us to book your ticket from Athens to Corfu (or from Corfu to Athens). The bus takes you to the Green bus station which is located near the airport from where we will come and pick you up. Excellent ecperiemce overall. The owners care for their guests, and the Pink Palace is a really nice place. It is a little distant from civilization, but there is a sandy beach nearby. Dining facility and food are both great. Go there! You will like it. They kept it very clean. Everyone was very nice and helpful. I was there 25 years ago and expected it to be a little run down, just by the age. They have maintained it nicely - I was surprised at how nice the facilities were. Great location and great staff, we visited in off season so there wasn’t much to see or do, but it was still amazing! Thank you! Very fun place to stay, especially for the price! Would recommend spending money for dinner- 4 course meal with big portions. Far from Corfu town, but a cheap bus can take you there and back (note that the station it drops you off at is NOT the same station to catch the bus back) friendly staff and lots of activities planned. DON'T stay here. No distinction between corfu backpackers & pink palace. "FREE" Airport transfer is actually 5euro & was a no show after sending multiple emails the day before. The location is terrible to explore other beaches you have to catch the public bus into the old town departing every 3 hours ish & then another bus to any beach. The public bus half the price of the hostel bus. Staff are rude & do not want to help except the english lady on reception. Food is a rip off & terrible. Some of the stuff is rude and unfriendly, like the barman and the guy with curly brown hair. The bus is free only the first time, other times 5€. Breakfast is disgusting and uneatable, very low quality. 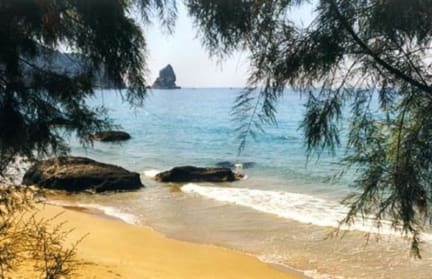 Location (Agios Gordios) very far from the city center. To visit other beaches you have to take a bus to city and then another bus to the beach. The building is old and with holes in the walls. When we came bathroom and bedroom where very dirty. The shuttle bus must have been washed in piss to get the smell that strong, the location is so far out of the way I spent most of my time on the island on buses, the shower floods, the rooms are in shambles, everything I touched was either greasy or grimey, there was only 1 wall socket in our dorm room and it was high up on the wall, the trek from housing to reception is literal hell, they don’t give you blankets, a night here isn’t worth €5. Just stay in Sidari. This place ain’t worth it.